I love TV game shows, and I especially enjoy finding out some of the secrets behind them! I grew up watching many now-classic TV game shows, including $100,000 Pyramid, Win, Lose, or Draw, The Price is Right, and Wheel of Fortune. My dad even made a guest appearance on a Nickelodeon TV game show called What Would You Do?, and I got to sit in the audience as the zany hijinks (including my dad’s plate spinning routine) went wild in the studio. So what about those game show secrets? I’ve done a lot of researching to find answers to some questions I’ve had about certain game shows. Why are the letters R-S-T-L-N-E always automatically preselected for the final round on Wheel of Fortune? Where did the the catchy thinking song on Jeopardy come from? How much are the taxes on game show prizes? What happens if you’re the final contestant on the last day ever of a game show series? Why are all the contestants on Jeopardy the same height? What’s the Monty Hall Problem and how does it explain the probability behind what doors to choose on Let’s Make a Deal? How did a contestant beat the system on Press Your Luck? What about the quiz show scandals of the 1950s? Read on for the prize-winning answers to those questions — and more! #1 – Why Are The Letters R-S-T-L-N-E Automatically Chosen In Wheel of Fortune? If you’ve been watching The Wheel of Fortune for a while, you’ve probably noticed that the same 6 letters are always given to contestants who make it to the last round of the popular word puzzle game show. The letters are R, S, T, L, N, and E.
Back in the old days (before 1988, to be exact), contestants who made it to the final round could choose only 5 consonants and 1 vowel. R-S-T-L-N-E just happened to be the letters that most contestants picked on their own because these are among the most common letters in many English words. However, a viewer did some independent research and determined that R-S-T-L-N-E may not be the most common letters to show up in the bonus round puzzles. He says C, M, D, and A are. Since the rule change, contestants get not only RSTLNE, but also 3 additional consonants and 1 vowel. Not too shabby, Pat Sajak and Vanna White! #2 – What Was The Press Your Luck Scandal All About? In 1984, one of the biggest scandals in TV game show history unfolded before the eyes of viewers who were tuning in to see Press Your Luck, a TV quiz game show with an elaborate electronic game board. Contestants who guessed answers correctly could earn spins on the game board. One man named Michael Larson started watching Press Your Luck soon after it debuted in September 1983. Hooked on the show, Larson quickly realized the 18 panels on the electronic game board lit up in 5 specific patterns to indicate what prize a contestant would win on their spin (or if they ended up losing all of their prize winnings with a Whammy). Larson spent nearly all of his money on taking a trip to Los Angeles to rehearse for the taping of Press Your Luck. He managed to get on the May 19, 1984 episode. Larson did it, of course, by essentially cracking the system — much to the chagrin of the CBS executives who could only stand by and watch, because there was no clause in the contract that said Larson broke any rules. #3 – Why Are Jeopardy Contestants All The Same Height? Well, they’re not. But they certainly all appear to be the same height! That’s because each contestant stands on a platform behind the podium that is raised or lowered so that all the contestants’ heads are roughly the same height for the camera. Have you ever wondered about the Jeopardy “think” music? You know, that catchy tune that most of us recall from the show. #4 – How Much Are The Taxes On Game Show Prizes? Unfortunately, nothing you win on any game show is free. Not the cash. Not the car. Not the new refrigerator full of ham. All of the prizes, and I mean all of the prizes, are subject to taxes. You’ll owe taxes not just to the Federal government, but also to the state where you live and the state where the game show is filmed. A lot of game show contestants end up turning down non-cash prizes because they are usually taxed at their retail value. So that “free” prize of a $1,200 refrigerator may end up costing you anywhere from $100 to $250 or more — when all the different tax obligations are considered. What about the $1 million cash prizes that some game shows award their winning contestants? Well, when all is said and done, the winner may not see much more than about half that amount. #5 – What The Blank? !… Was There Drama On Match Game? The top daytime television show during much of the 1970s was none other than Match Game. Match Game was a show featuring contestants who would come up with (sometimes crazy) answers to fill-in-the-blank questions. The object of the game was for the contestants to match the answers provided by a panel of celebrities. While several versions of the game show have been filmed since the early 1960s, the Match Game most people think of was a 1970s-era format hosted by the amiable Gene Rayburn. Rayburn’s Match Game (a Mark Goodson-Bill Todman production) ran from 1973 through 1982 on CBS and in syndication. During most of that period, a version called Match Game PM performed well in prime time. Many celebrities appeared on Match Game, including Betty White, Nipsey Russell, Rip Taylor, Michael Landon, and Vicki Lawrence. One of the show’s first guest panelists, Jack Klugman, suggested his wife, Brett Somers, appear on the show. She did. And the audience loved it. Soon, Broadway actor and comedian Charles Nelson Reilly, one of Rayburn’s personal friends, made an appearance on the show. The chemistry between Reilly and Somers helped them become fixtures on the show for the remainder of the classic Match Game era. But what about all of their bickering on the show? The mean jabs at each other? Was it all real… or just some good-humored fun? It was all fun — and that’s exactly how Brett Somers and Charles Nelson Reilly (who became BFFs) would both describe their time on the Match Game during interviews in later years. In fact, they even appeared together during “Game Show Week” in the same celebrity square on Hollywood Squares in 2002. Perhaps the biggest on-set drama centered around the show’s 3rd regular panelist: Richard Dawson. For 4 years, he was frequently called on by contestants to match their answers during the bonus round. The “problem” was that Dawson was almost always preferred. He usually seemed to think what the contestants were thinking — which is one reason he was so popular. However, Match Game producers wanted to ensure the other contestants were chosen, too. In 1978, the Match Game Star Wheel was introduced — which forced contestants to spin for a celebrity matchup, versus choosing whoever they wanted among the panel. Understandably Dawson took the move quite personally, but that isn’t the often-cited reason why Dawson soon decided to resign from the Match Game. Dawson was focused on nurturing his new game show, which was climbing in the rankings, and thus left the Match Game, which had been replaced as the highest-ranking game show on daytime TV by — you guessed it — Family Feud. 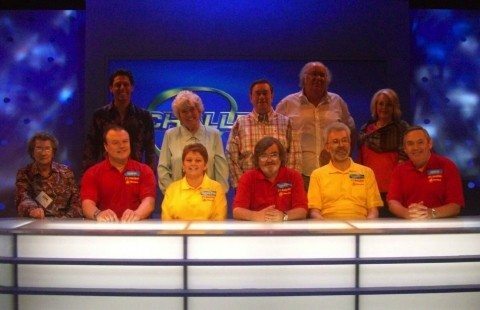 #6 – What Happens If You’re The Last-Ever Contestant On A TV Gameshow? All TV game shows, even the most popular ones, must come to an end sometime. In many cases, this isn’t really a big deal, save for the sad goodbyes. But what happens on game shows where the format calls for winning contestants to return on following episodes to win more prizes? It’s kind of hard to return the next day as a returning champion when there’s no game show to return to! Every game show has its own way of resolving this problem. For example, when NBC’s Card Sharks ended on October 23, 1981, the last contestants to ever appear on the show were given the chance to win an especially large prize in an expedited challenge that ensured there was no unfinished business before the credits rolled. #7 – What’s The Monty Hall Problem? Monty Hall is an iconic TV game show host who is perhaps most well known for his multi-decade run on Let’s Make A Deal. The show involved contestants (virtually all of whom dressed up in outlandish costumes) who were referred to as “traders.” These traders, who were given small prizes had an opportunity to make “deals” with the host by either keeping their winnings or potentially trading up for a mystery item behind a series of closed doors. The challenge: Guessing what’s behind the doors. In many cases, traders would trade up to trips, new kitchen appliances, and even new cars. But sometimes the trade didn’t go so well for the contestants. Many ended up getting “zonks” — rusty old clunkers, farm livestock, or huge dolls. While providing great entertainment for the viewer, the method of selecting which door to open serves as a great probability challenge for those who enjoy math and logic. It’s widely referred to as The Monty Hall Problem or Monty Hall Paradox. In sum, the Monty Hall Problem addresses the effect of switching your choice of doors in the pursuit of opening the correct one with the prize. #8 – What Caused The Quiz Show Scandals Of The 1950s? In the 1950s, TV was brand new. So were game shows — which quickly took off as one of the most popular types of programming. Some TV game show producers thought a great way to drive up viewership would be to arrange certain outcomes on quiz game shows by secretly assisting contestants. The contestants played along, and without regulations at the time banning such practices, some (but definitely not all) of the most popular quiz game shows of the 1950s, including The $64,000 Question, were essentially rigged. This scheme didn’t last long. A contestant on a quiz show called Twenty One blew the whistle on the game show in 1958. It was soon revealed that many TV quiz game shows were rigging their programs. Ratings on quiz game shows plunged because of this at the end of the 1950s, as did the reputations of several gameshow hosts. The quiz show scandals were examined in the 1994 movie Quiz Show. Tips From TV Game Show Winners: How To Win!